Christmas isn't over...yet. For us, at least. I usually manage to hold onto it for a week or two after the actual date. I have an excuse this year, though. Christmas with my dad's side of the family isn't until Sunday. We've got most of the gifts together but a couple cousins just wanted gift cards. Now that I have my Silhouette Cameo, I've got to make something cute, right? 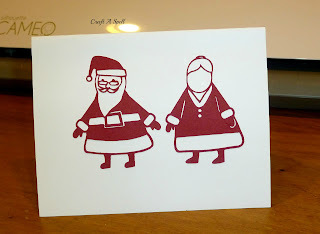 I managed to pick up a free shape of the week from the Christmas stock called Santa and Mrs. Claus (if you hurry up, you might still be able to get it free!). I cut my construction paper down to 9" x 6.5" (WxL). I lined up HOHOHO down all the sides and centered the image on the bottom half with 'Merry Christmas' underneath it. 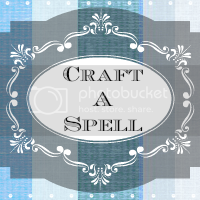 Does anyone know if you can share Silhouette files? I tried to upload mine to show you but couldn't. I wish I could show you what it looked like. Sorry! I could at least take a screen shot of it if anyone wants to see. When I peeled my paper off the cutting board, it came out like this. I didn't even think that it would just be a silhouette. But I worked with it. I folded my paper in half and glued some white pre-cut card stock to the inside so you could see the outline. Here is what the back looks like. Because I inverted the text at the top, the HOHOHOs line up on both sides perfectly. Using a safety pin to punch holes in the middle/binding, I then threaded a bit of baker's twine to secure the pieces together (and to look pretty - the glue will probably hold it just fine). 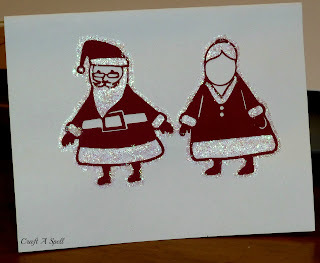 To add some dimension, I coated the silhouettes of Santa and Mrs. Claus with Mod Podge and sprinkled white glitter over it. I then used silver glitter glue to add some sparkle to the lettering. Unfortunately, my glitter glue plopped out a nice big glop so I had to smear it around. Luckily, you can't see the glue part of it, despite what the camera flash is showing here. 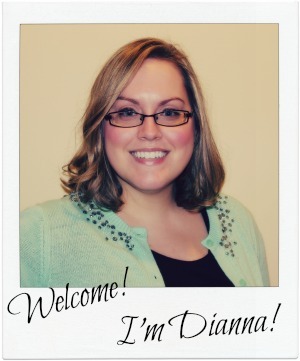 I think it came out nicely for my first card! The best part, however, was that I technically got two cards out of the one cut. 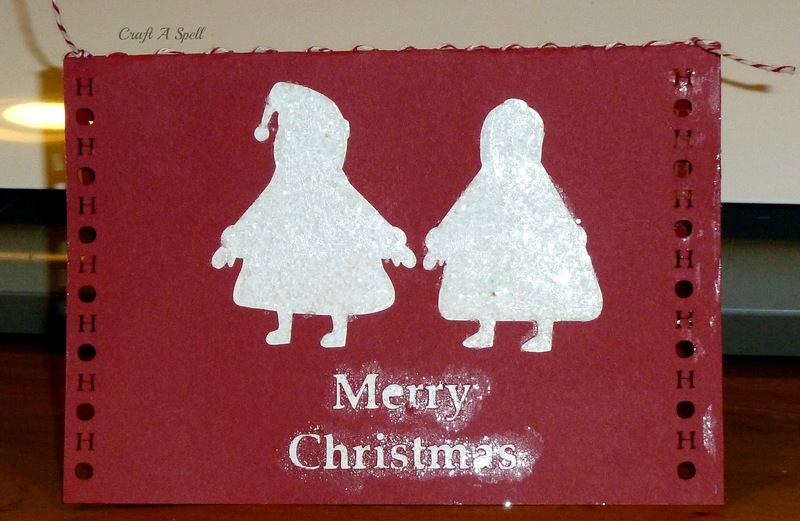 I peeled off the leftovers on my cutting mat and glued them to a piece of pre-cut card stock. 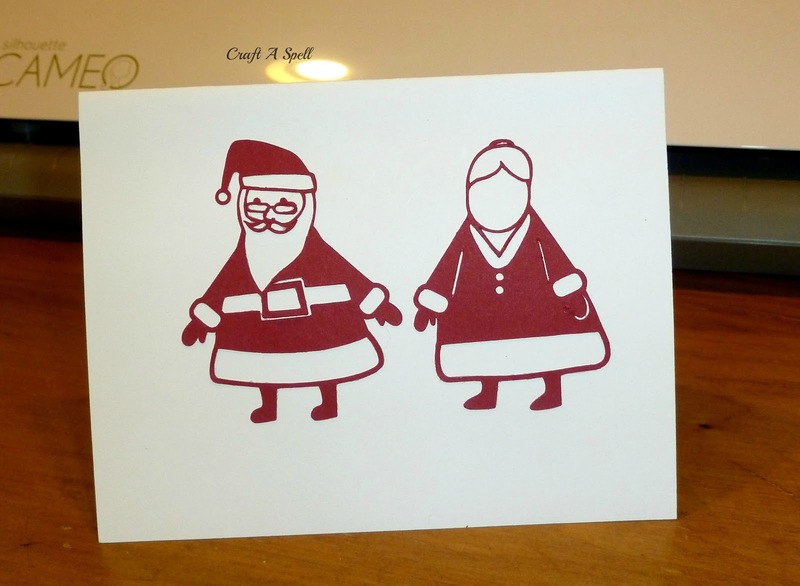 For some reason, though, Mrs. Claus' face wasn't attached to the rest of her and it got smooshed during the transfer. Sorry Mrs. Claus! You still look cute, though. Especially with the addition of white glitter glue! This one is my favorite and a wonderful added bonus. 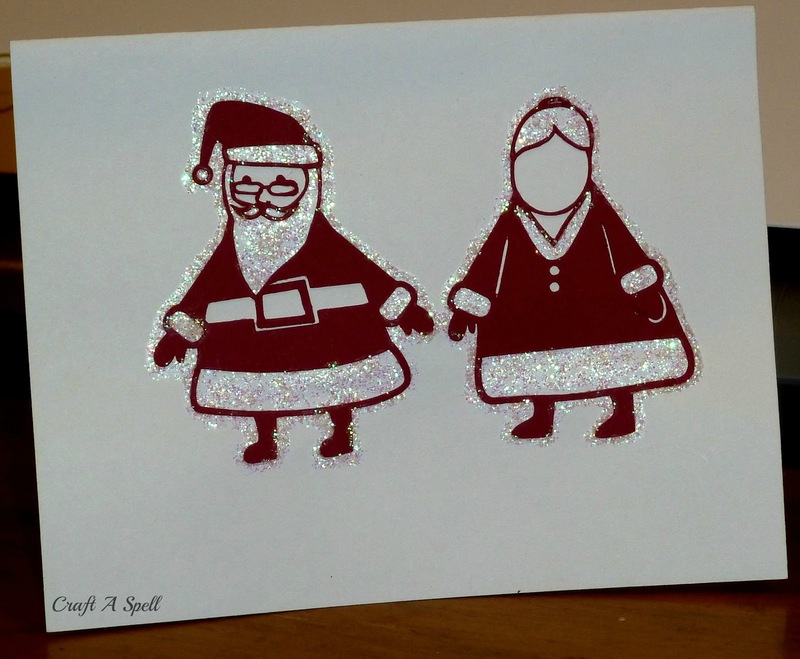 Check back tomorrow for another Christmas card I made! I'm sharing my projects here!